card for a sample so here's what I came up with. My card base is 7 1/2 by 10 1/2. The 10 1/2 inch side was scored at 3 1/2 and 7 to get my three panels. I cut the top two inches off of the third panel (5 inches high) and rounded the top corner then folded it in to create the money pocket. To secure the pocket I used some sticky strip along the bottom of the flap. Here's a view of the front of the card and the matching envelope. I didn't have any envelopes to fit the card so I had to create my own. I'll try to include the directions for the envelope in my next post. For the card front I used the retired SU Ruff Day set and greeting from Papertrey Ink. They're both stamped with Brown Stazon and the puppy is colored with an aqua painter and Distress ink re-inkers. The designer paper is from Chatterbox and the red is from Bazzill. I tied a piece of ribbon around the image panel and mounted it with pop dots to finish the card. Here's another money card using the same layout, more Chatterbox papers and the TAC Monkey Business set. Thanks so much for stopping by. Please check back if you're interested in the details for the envelopes. My on-hand supply of masculine cards is very small so I pulled out this unmounted elk image and made up a couple of cards. For this first card, I stamped the image with palette hybrid black and colored it with my copics. 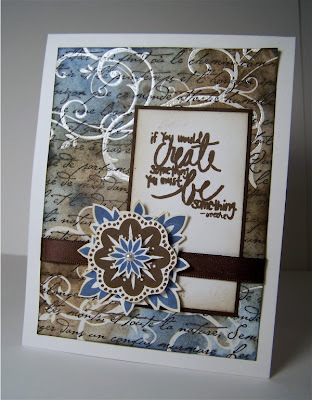 The sentiment is from Paper Trey Ink and stamped in Timber Brown Staz-on. The patterned paper is from My Mind's Eye and the card base is SU Kraft. I added a row of paper piercing across the top instead of using ribbon. For the second card I stamped the same image with Brown Staz-on and colored it with my prismacolor pencils and OMS. I used the same greeting from Paper Trey Ink and punched it out with the small oval punch from SU. The patterned paper and red solid are a piece of unmarked double sided paper I found in my craft room. I think it might be from CosmoCricket. The mat on the image is SU Chocolate Chip and the card base is SU Kraft. Instead of using ribbon on this card I added some thin twine. I don't know where the elk image is from. I've had it for a couple of years and I know it was part of a grab bag but I don't remember where I bought it. 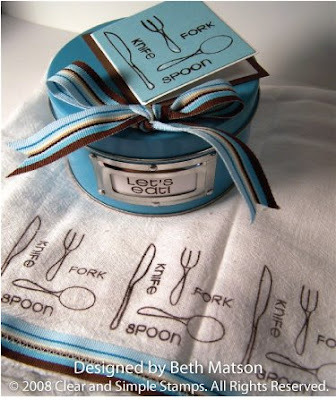 dinner, consider bringing a hand decorated towel as a hostess gift. I altered a flour sack towel by sewing a strip of ribbon along the bottom of the towel and then stamping just above the ribbon. 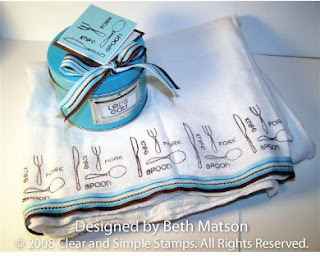 For the stamping I arranged the silverware and words from the Bon Appetit set by Clear and Simple Stamps on my acrylic block and then stamped them repeatedly along the bottom of the towel using VersaCraft ink and heat set them with my iron. I picked up the little tin for $1 at Michael's and thought it would work well to hold the towel so I stamped the Let's Eat sentiment and put that on the front of the tin then added a bow and small little matching gift card to the top. I plan to roll the towel up to fit in the tin. This will be great to have on hand the next time I need a little hostess gift. Thank you so much for stopping by. I hope you're all having a wonderful day! I love this set from Gina K Designs but really haven't taken the time to use it so I pulled it out this morning before work and put this card together. I used SU certainly celery for the base with a mat of wild wasabi and groovy guava. I stamped the words on the whisper white piece with palette hybrid noir and then I stamped the little man on another piece of whisper white and cut him out leaving the hat extending past the circle and matted him on wild wasabi. I colored him with prismacolor pencils and OMS and mounted him to the card with popdots. Side Note: I just noticed that I forgot to color the gift he's holding so I'll have to finish it before I use it. Oops! Is that a sign of age? Forgetful?! I hope you're all having a wonderful week. I can't believe it's Wednesday already. Thanks for stopping by! Here's my first card using SU's Fresh Cuts set. I decided to emboss the image with white on Kraft cardstock and add a little bit of color using my Prisma color pencils. I added a couple of mats (olive and white) and attached it to a Kraft cardbase. 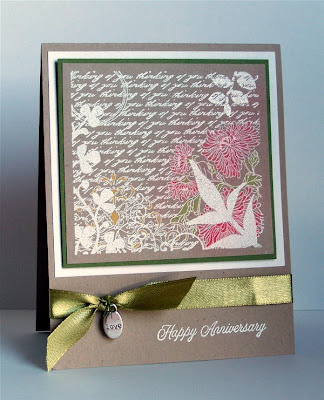 The happy anniversary on the bottom of the card is also embossed with white. For the finishing touch I added some olive green ribbon and a charm. I think I'm going to get a lot of use out of this set. Thanks for stopping by! 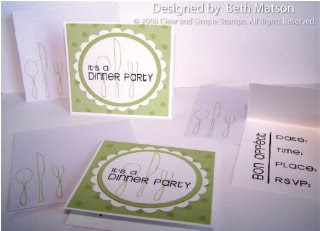 Have you seen the Bon Appetit set from Clear and Simple stamps? It's great for party invitations. I made up this set of 3x3 invitations to use for our next party. I arranged the spoon, knife and fork together on my acrylic block and stamped them on the corner of the envelopes with SU Certainly celery ink and again on a piece of white cardstock. I used my nestabilities with my cuttlebug for the circles. Over the silverware I stamped the words in Archival ink. The card base is white and the polka dot paper is from SU. This picture shows the inside of the invitations. Thanks for stopping by! I hope you're all having a wonderful day! Just playing with some different color combinations of Distress inks to create background paper. For this one I stamped the script background with black archival ink on white cardstock and then I stamped the swirl from the SU Baroque Motifs set ink versamark and heat embossed it with clear embossing powder. Finally I laid brushed corduroy, antique linen and faded jeans distress inks on my craft sheet and ran the background piece through the inks. The quote from the Quotopia set by Inque Boutique. I stamped it with brown chalk ink and added some antique linen distress ink around the edge of the panel. The flowers are also stamped in chalk ink then cut out and mounted with dimensionals. Here's a side view of the flowers. Also, if you're interested you can stop by the Artistic Outpost blog today and see my cards. 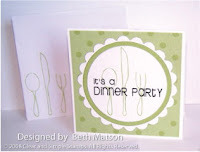 What an honor to have Lisa Somerville ask if she could share my cards on the company blog. Thanks Lisa! As always, thanks for stopping by. I hope you're having a great day! Here are a couple more cards using the scor-pal to create my own patterned paper. See original post here for details. 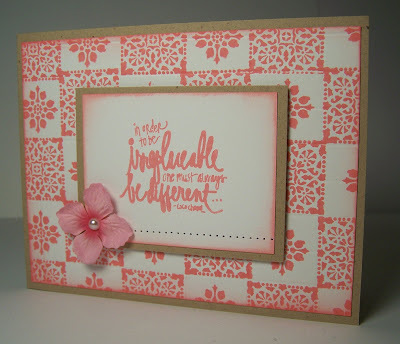 For the patterned paper on both cards I used the Fontwerks Signature Flowers set again. 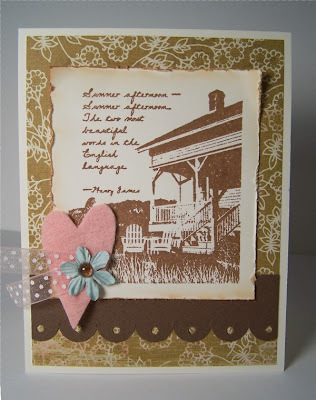 The first card uses antique linen and worn lipstick Distress Inks. The sentiment is from Inque Boutique's Quotopia set. 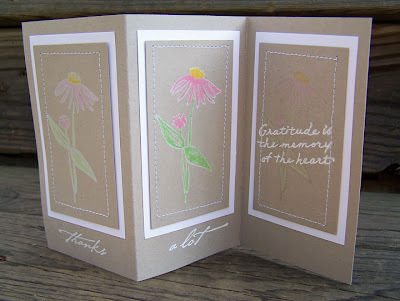 It is stamped in brushed corduroy Distress Ink on vanilla cardstock and the edges are sponged with antique linen. 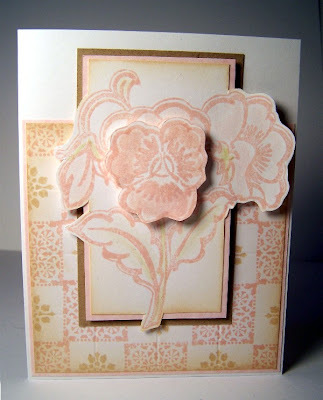 The card base is Kraft and the flower is from Prima. The second card uses only worn lipstick Distress Ink. 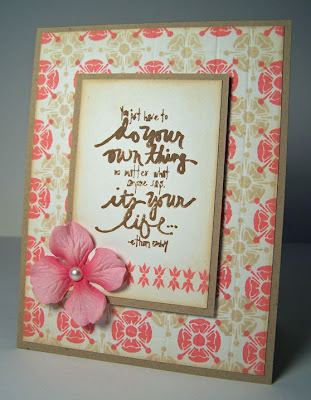 The quote stamp is also from the Inque Boutique Quotopia set. Here's just a simple tri-fold card using some neglected Hero Arts stamps. For the first two panels I stamped the coneflower with colorbox white pigment ink and let it dry. Then I colored over the white with Prisma color pencils. For the third panel I stamped the flower in versamark and colored over it very lightly because I wanted to make sure the words would show up. Each panel is stitched with my Janome Sew Mini and the "thanks a lot" are heat embossed with white. I love the new Keeper set from Artistic Outpost! It just reminds me of all those lazy days spent at the cabin. For this card I stamped the image with Vintage Photo Distress Ink then distressed the edges with my Heidi Swapp distressing tool and sponged the edges with more Vintage Photo Distress Ink. The patterned paper is from My Mind's Eye (I think) and the brown is a scrap from my LSS. I used a SU slip punch to create the scallop border and then punched each scallop with my mini circle punch. I cut the heart from felt and added some ribbon, a prima flower and a dew drop. Thanks for stopping. I hope you're all having a Happy 4th of July! 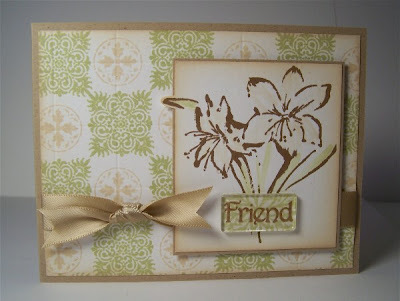 Just a quick post to show you another card using my scor-pal to create patterned paper. When I saw Nichole Heady's sneak peak of her new Guide Lines set I pulled out my Scor-pal and came up with my own version. I knew the Signature Flowers set from Fontwerks that I had would be perfect for this. 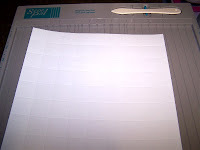 Using my Scor-pal and plain white cardstock I scored the cardstock every half inch in one direction, turned it 90 degrees and scored every half inch again creating a grid. 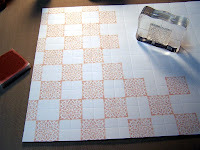 Next I stamped one of the square patterns with tattered rose Distress Ink using my scored lines as a guide. After I stamped the entire sheet with the square I inked up one of the circle stamps using antique linen Distress Ink and stamped that in the center of each remaining square. For my card, I sponged the edges with more antique linen Distress Ink and matted it with some pink cardstock from my LSS. 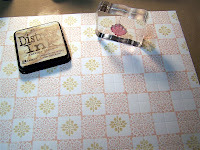 The pansy stamp is from Rubbernecker Stamp Company and stamped in tattered rose Distress Ink. I added a little shabby shutters reinker to the flower stems and leaves and some tattered rose to the flowers. I also stamped a second flower and cut out just the center one and mounted it with pop-dots for some dimension. Take a look at your stamps and see what you have that might be perfect for this technique. I know I'll be getting a lot more use out of this set now using this idea. Thanks for stopping by!